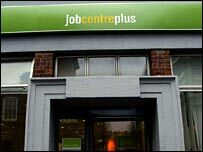 Up to 13,000 Job Centre staff may have had personal details stolen by criminals making fraudulent claims for tax credits. HM Revenue & Customs shut its web site for tax credit applicants on 1 December after discovering that false applications had been made. It was first thought that up to 1,500 job centre staff might have had personal details stolen. The Department for Work & Pensions said a criminal investigation had begun. The PCS trade union has called for the scale of the problem to be revealed. It now appears that the criminals have stolen the national insurance (NI) numbers, names and dates of birth of thousands of Department for Work & Pensions (DWP) staff working in job centres in London, Glasgow, Lancashire and Pembrokeshire. One job centre employee, who wished to remain anonymous, told the BBC that 90% of the staff in his office had been affected. "I went to work on Tuesday. I called the helpline. I was on the phone for 15 minutes and eventually was told that a claim had been made in my name. "My greatest worry is that if these people have got our identity details they can apply for loans, open up bank accounts and two or three years down the line that's your credit rating destroyed." The DWP said that this particular fraud seemed to have been going on for a couple of months. The key to its success is that to make an online application for tax credits, a member of the public has to supply very few details. Claimants simply have to type in a name, NI number, date of birth, tick a few boxes and lie about their earnings. David Laws, the Liberal Democrat spokesman on work and pensions, blamed the desire of Revenue & Customs to increase the uptake of the credits. "They've left it open as almost a fraudsters' charter by allowing people to make telephone claims and internet claims very easily without some of the checks that should have been made," he said. Mr Laws accused ministers of "hushing up" the fraud by claiming that the matter is under police investigation. A spokeswoman for the DWP said: "We are taking this issue very seriously. A criminal investigation is now under way and we are working hard with HM Revenue & Customs to resolve the matter. "Our staff are understandably concerned but we are confident from the information we have that the issue is limited to a specific group." The emerging details of this fraud, and its sheer scale, help to explain why the tax credit system has been losing so much money. It was introduced in its present version in 2003 to pay the new working tax credits and child tax credits. Ever since it started it has been widely criticised for being what the Public Accounts Committee recently called an administrative "nightmare". They highlighted the fact that in its first year of operation (2003/04) £16bn was handed out to 5.7 million families. But 1.8 million of them were overpaid by £2.2bn. Although this was partly due to administrative and computer problems, the National Audit Office claimed in October that fraud had contributed to £460m of that overpayment, along with mistakes by claimants. Nearly a billion pounds of accumulated overpayment from the first two years of the current tax credit system will probably be written off as doubtful debt.